Awesome. Amazing. Phenomenal. Once in a lifetime. Those were the adjectives Steelers Nation Unite members used to describe what they experienced this past weekend. It’s hard to blame them, as they found themselves among the Super Bowl XL champions and Steelers legends. That was Williams reaction when talking about the experience she had just received, as Lori, her guests and two other Steelers Nation Unite members were part of the Super Bowl XL alumni team photo on Sunday morning. It was a “Who’s who” of that team, with players in attendance including Jerome Bettis, Brett Keisel, James Farrior and Antwaan Randle El. Ben Roethlisberger and Greg Warren even popped in quickly to see their old teammates and be part of the photo. Flash forward to Sunday and members again found themselves on the field as part of the Players Tunnel and Terrible Towel Twirl, which was led by “Fast” Willie himself. The biggest surprise of the day, though, may have come in the Heinz Field seats during the third quarter. 10 former players dispersed throughout the crowd to make surprise deliveries. Jeanie Van Scoyoc was seated in Section 516 and watching her team take care of business. She was informed earlier in the week to make sure was in her seat during the third quarter. 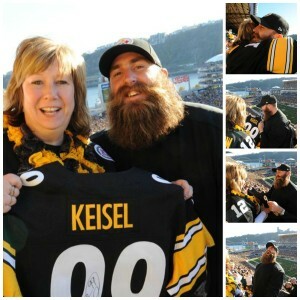 That’s when Brett Keisel and the Heinz Field scoreboard camera showed. Signed jersey in hand, Van Scoyoc was shocked to see ‘Da Beard’ headed her way. With fans all around excited to see one of their favorites right in the seats, Van Scoyoc gave Keisel a big hug and was all smiles with her new piece of Steelers memorabilia. While that was on the scoreboard, the likes of Casey Hampton, Max Starks, James Farrior, Kendall Simmons, Chidi Iwouma, Jeff Hartings, Bryant McFadden, Marvel Smith and Dan Kreider showed up at different spots around the stadium. 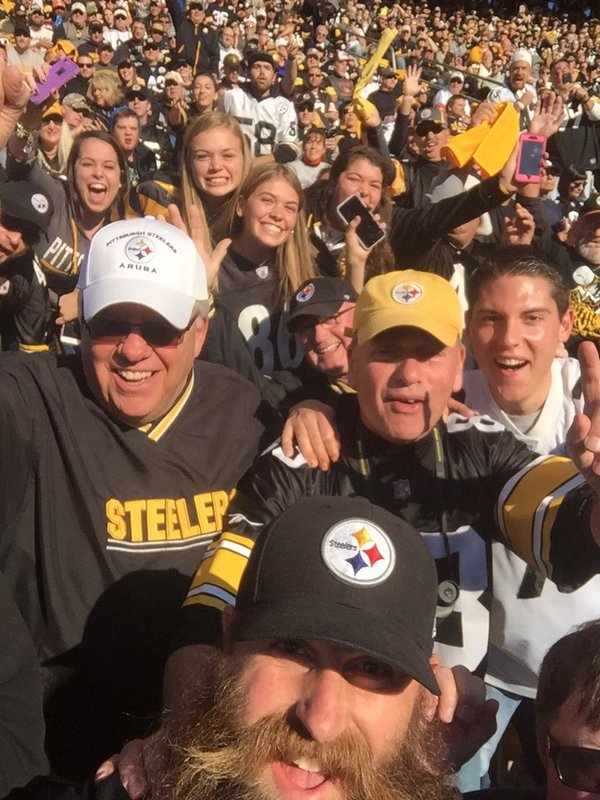 It was a special moment that fans were afforded just for being members of Steelers Nation Unite. 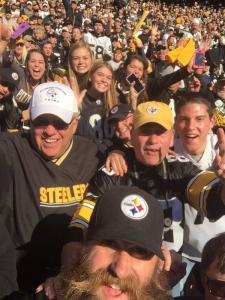 If you are not a member of Steelers Nation Unite….JOIN NOW and the next big fan experience could be YOURS!